For quite a few years, the official states-visited travel counter here in Fybush-land sat stubbornly at “45,” and without any particular rhyme or reason to what had been left out over the years. In 2011, I managed to knock two more notches off that list: Big Trip 2011 checked off New Mexico, and a surprise last-minute drive across the country later that same year included a short detour into Arkansas, getting the count up to 47 and leaving just one state unvisited in the Lower 48. “48 by 40” was the motto as your editor’s 40th birthday approached in 2012, but family illness intervened and kept intervening, and so that last remaining hole stayed unfilled into the summer of 2013, when the rental NERW-mobile finally zipped its way northward up I-29 late on a blue-sky Wednesday afternoon. And with that milestone now checked off (and “50 by 50” still well within reach – watch out, Alaska and Hawaii! ), it’s up the road we go for dinner on the south side of Fargo, check-in to a fairly mediocre motel (this is not the cheapest small city in America), and on to one of the more exciting Thursdays of our long and questionably sane tower-hunting existence. This is where we fix that. OK: history time. 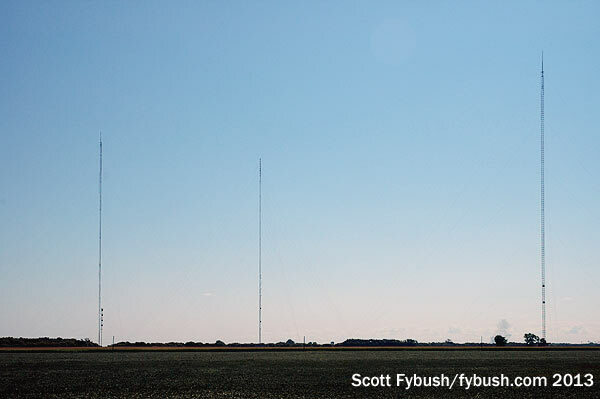 When this 2,063-foot tower rose from the flat, flat farmland of Blanchard, 40 miles or so north-northwest of Fargo, in 1963, it was the culmination of a tall steel arms race that had been underway around the country for more than a decade. The title of “tallest tower in America” passed from contender to contender fairly rapidly before the FAA imposed a cap on tower height – a cap that left this one standing as the highest that could or would exist. Basic foundation work was done by the Swingen Construction Company of Grand Forks, N.D. The tower base was poured over 87 wood pilings that were driven deep into the ground. The hexagon shaped base is 8.5 feet deep at its center and required 145 yards of concrete to make it sturdy enough to hold the weight of the 864.500 pound structure. Nine, 16-foot-deep, T-shaped excavations surround the tower base and hold steel guy wire anchors measuring 20 to 30 feet in length and weighing nearly 4,000 pounds. Each of the nine anchors are held in place by 50 yards of concrete – enough to pave 15,900 feet of city sidewalk. 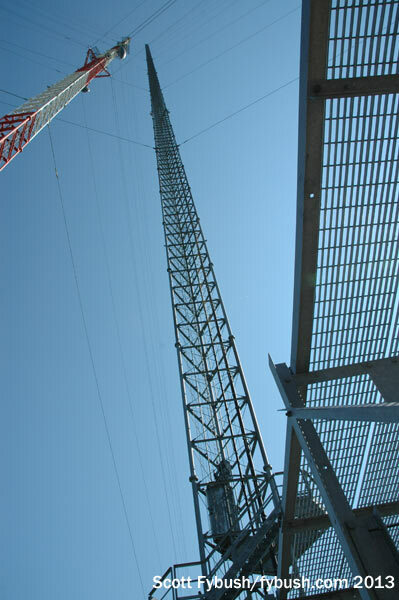 More than 40,000 feet of guy wire is used between the anchors and the tower. The tower and guy anchors take up 160 acres of land. The total length of the guy wires is 40,125 feet or 7.6 miles. 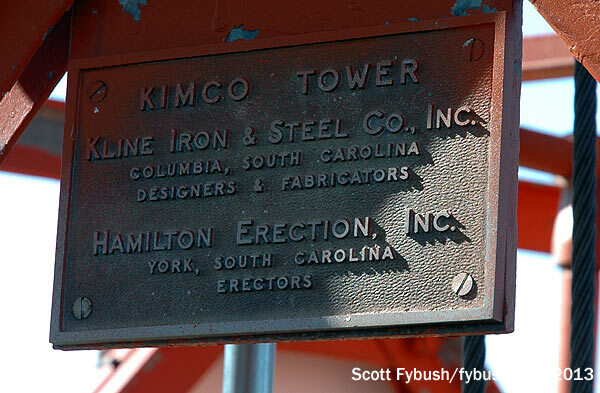 The tower itself was fabricated by the Kline Iron & Steel Company, Columbia, S.C. and is made of more than 36.659 individual pieces of steel. The tower was assembled in 33 working days by an 11-man crew with no casualties. There are 14 levels of lights on the tower, seven levels have two flashing 600-watt beacons spaced 300 feet apart. Six other levels, spaced between beacon levels, consist of three 130-watt obstruction lights, one on each leg of the tower. The steel tower is taller than the combined heights of the Great Pyramid Khufu at Giza, the Eiffel Tower and the Washington Monument. If a 30-second commercial started at the same moment a baseball was dropped from the top of the tower, it would have ended nearly four seconds before the ball hit the ground. In a 70 mph wind, the beacon light on top of the KVLY tower will move approximately 10 feet. If an iron worker on the antenna dropped his wrench, it would be traveling at a speed of 250 mph when it hit the ground. If a hunter at the base of the KVLY tower shot at the lead goose flying near the top of the tower with a .45 caliber pistol, he would have to lead the goose by more than the length of a football field, approximately 335 feet. The tower serves an area larger than the combined areas of Rhode Island, District of Columbia, Delaware, Hawaii, Massachusetts, New Jersey and Connecticut with 1,000 square miles to spare. It’s hard – impossible, almost – to convey just how impressive this beast is when seen in person. Approaching from the east, off I-29 at ND 200, 35 miles north of Fargo, you can see the tower for nearly all of the ten-mile drive westward to the dirt road (“153rd Ave SE”) off which it sits. The nice folks at KVLY try to discourage casual visitors these days – too many would-be BASE jumpers and others who don’t have the best of intentions – but if you can arrange a formal tour, as we did, you’ll find a fairly simple setup out here these days. 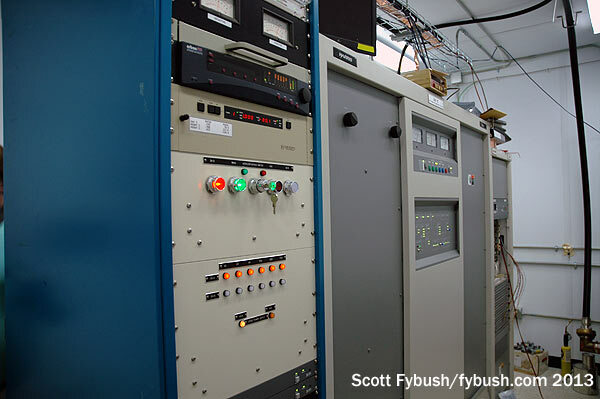 The two-story block building at the tower base has storage, power handling and HVAC on the ground floor, with a staircase leading up to the big square transmitter room upstairs. 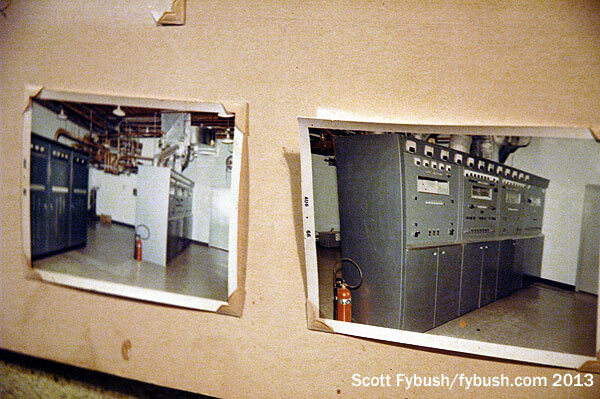 When my tower-hunting colleague Garrett Wollman was out here in 2009, the original 1963-era GE analog transmitter was still in place, but four years later there was an empty hole where the GE used to be and empty holes, as well, where a lot of the analog gear had been in the racks that lined the other walls of the room. Only the little solid-state Larcan UHF transmitter on RF 44 remained active near the back wall, putting out just under 10 kW of RF to generate a 356 kW ERP from a directional antenna side-mounted up the tower, 1889 feet above average terrain. No, we had no idea until we sat down to write this piece that our visit came precisely during the 50th anniversary of this mighty tower’s construction. We were there August 8, 2013, and the 33-day tower erection was completed August 13, 1963. And no, these pictures don’t even come close to doing justice to this mighty tower – but if you click on the thumbnails here (and on every other Tower Site of the Week page), you can at least make them bigger. Look six miles south from the KVLY-TV site and you can see another, slimmer tall tower off in the distant haze. 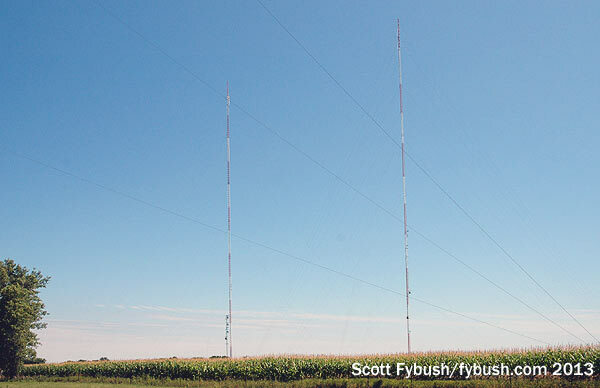 At 2,060 feet, the tower of KXJB (Channel 4) is just three feet shorter than KVLY, but the Buzz Aldrin of the North Dakota tall towers just never quite achieved the glory of its slightly taller neighbor. Having signed on in 1954 as the second TV station in Fargo, KXJB was the CBS affiliate all along, licensed to Valley City, just west of Fargo. Its original tower was just over 1000 feet and was located southwest of here, 15 miles northeast of Valley City, with at best a fringe signal up to Grand Forks. 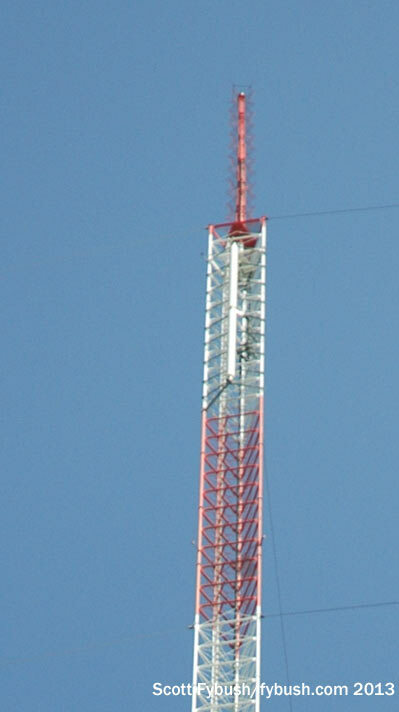 In 1966, KXJB joined the tall-tower club up here, erecting its original 2060-footer to provide clear pictures to both cities. Now the unfortunate part (at least the first unfortunate part): in 1968, a Marine helicopter clipped a guy wire of that new KXJB tower, bringing it down and killing all four people in the helicopter. KXJB returned to the Valley City site while building a replacement tower up here near Galesburg in just under five months. That tower, in turn, stood until 1997, when an ice storm sent most of it toppling over. Wikipedia’s entry on the “KXJB-TV Mast” claims that a 735-foot “replacement tower” went up at the site in the spring of 1997, but I’m pretty sure that’s actually the stub of the 1968 tower. In any event, it’s still here, next to the slim but well-reinforced replacement tower that went back up to the 2060-foot height in 1998. Which brings us to the second unfortunate part: KXJB-TV ceased to exist, as such, just a few days before this piece was published. Blame the duopoly rules: a series of sales eventually made KXJB a sister station under a shared-service agreement to Hoak’s KVLY, operating from the KVLY studios on the south side of Fargo with one newsroom producing “Valley News Live” newscasts that aired on both the CBS and NBC affiliates. When Hoak sold to Gray, the FCC’s tightening of duopoly rules meant that it made legal sense to put both the CBS and NBC program streams on the KVLY license. 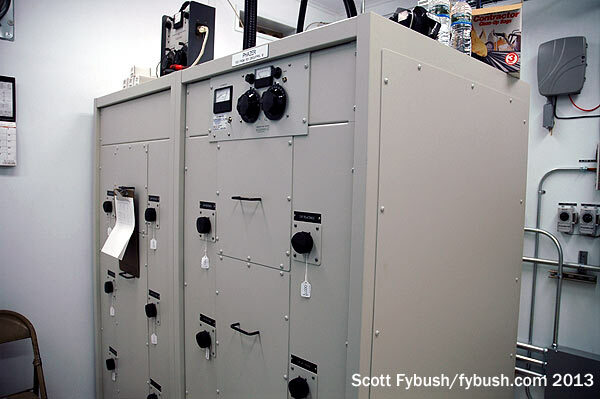 Today, 11.1 is NBC, 11.2 is CBS and 11.3 is MeTV, all broadcasting over RF 44 from the KVLY tower up near Blanchard – and as of December 1, 2014, KXJB’s channel 4 signal is off the air awaiting a new buyer. When and if that buyer emerges, they’ll get the license for RF 38/virtual 4, but no studio or programming, or even channel 4 on cable and satellite, which is still “KXJB” over KVLY’s 11.2. And they’ll get at least the use, if not the ownership, of this very tall tower that still stands near Galesburg, North Dakota. 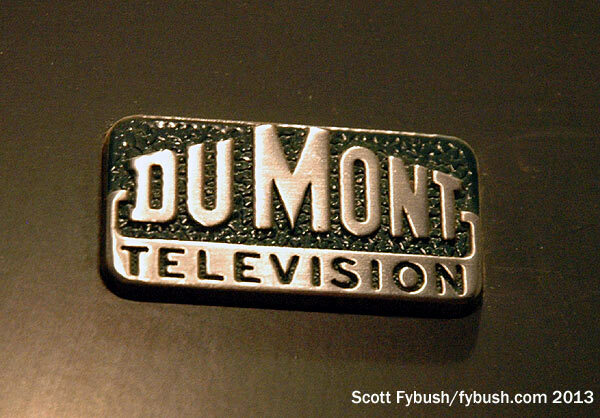 The oldest TV station in Fargo went a different route when it came time to try to serve both Fargo and Grand Forks. WDAY-TV (Channel 6) signed on in 1953 as the sister to the state’s oldest radio station, WDAY (970). 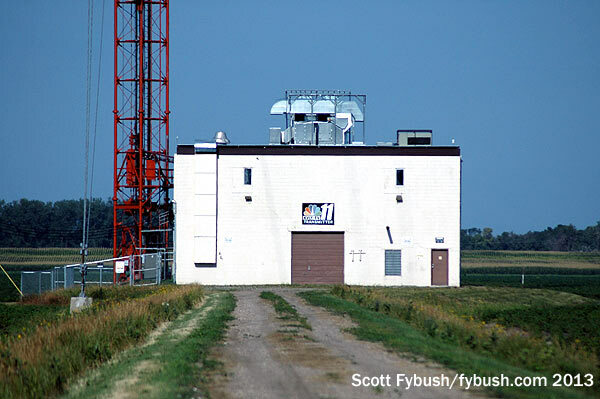 Originally an NBC affiliate, channel 6’s first tower was just south of Fargo on what was then US 81, the main north-south highway in the area. 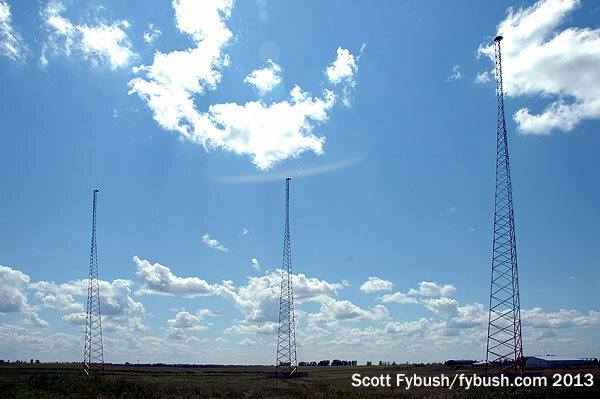 Two more tall towers joined the club here in the 1980s and 1990s, just east and a bit north of WDAY-TV. 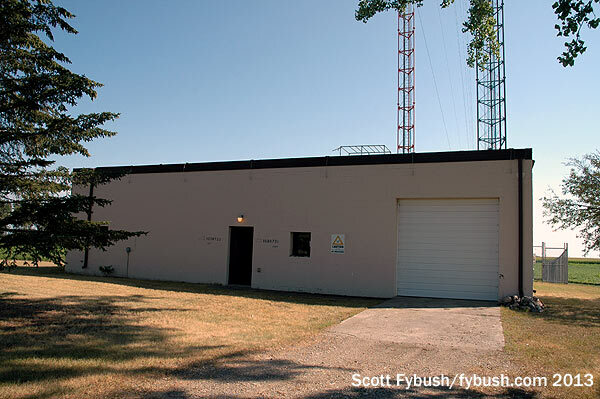 Public station KFME (Channel 13) moved from the original WDAY-TV site to a 1200-foot tower here, the northernmost in the group, in 1981, and its tower later became home to public radio KDSU (91.9) and to religious KFBN (88.7). KFME’s old analog channel 6 antenna still sits atop the tower, with the RF 23 digital antenna just below, then KDSU below that and KFBN on the opposite face of the tower below that. 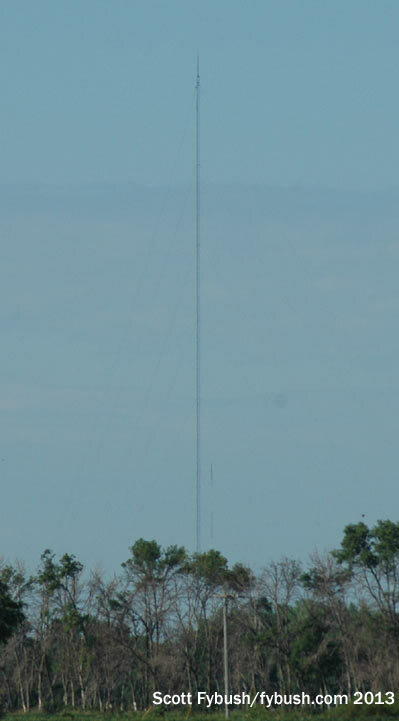 WDAY-FM (93.7) used to be on the WDAY-TV tower until WDAY sold the FM (and only the FM) to Clear Channel in 2000. That’s when “Y94” moved just a smidge to the north and east, joining religious KFNW-FM (97.9) on the thousand-footer it had built in the mid-1990s. The third FM sharing the 8-bay antenna here is KRWK (101.9 Fargo), and we’ll hear more about it and WDAY-FM in our next installment. Back over at the WDAY site, the old channel 6 antenna still sits at the top of the tower, with the current RF 21 DTV antenna side-mounted below it. A storm in 2011 toppled one of the three towers in WDAY’s array here and damaged the other two, and the station limped along under STA from this site while building out a new site way out to the southeast of town near Barnesville, Minnesota. In the summer of 2013, the transmitter building and one tower still remained here, but the site was silent and the long broadcast history at this location had come to a close. Climbing the imposing stairs to the lobby, we head out of the office part of the building and over to the TV studio that was added to the south side when WDAY moved in. Master control here handles not only Fargo’s WDAY-TV (Channel 6) and WDAZ (Channel 8) in Grand Forks/Devils Lake but also two more ABC affiliates in western North Dakota, KBMY in Bismark and KMCY in Minot, so if you’re watching the Alphabet Network in North Dakota, it’s coming through master control right here. The control room here handles WDAY-TV’s local newscasts, which are also seen up north on WDAZ at all times except 6 and 11 on weekdays, when a small studio in Grand Forks produces local news for that area. WDAY-TV’s studio is out back here, and there’s a big garage behind there that houses remote trucks that roam the state producing local sports and other programming. Back we go into the basement of the main building, where a long institutional hallway leads into both the AM studio and the adjoining newsroom for both AM and TV. WDAY radio does a lot of simulcasting of the TV news, but it also has a robust lineup of local talkers in its glassed-in studio looking out into the TV newsroom. From here, we pile into the car with WDAY engineer Dave Johnson for the ride out I-94 to see the AM station’s new transmitter site. 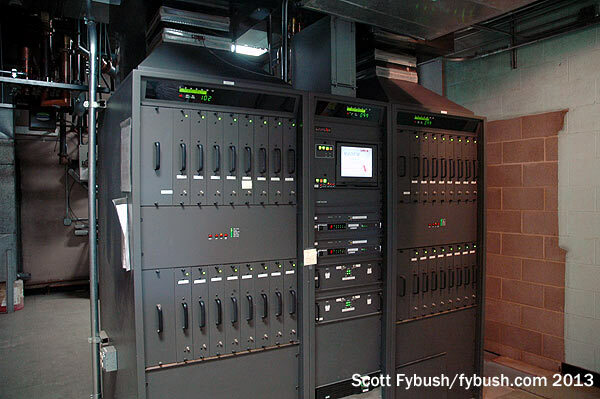 The move from West Fargo to Barnesville gave AM 970 a power boost from 5 to 10 kW fulltime, not to mention the benefit of a new facility built to modern standards from the ground system up. WDAY’s three new self-supporters sit within sight of I-94, about 20 miles southeast of Fargo over on the Minnesota side of the Red River, and what this site lacks in the charm of the old one, it makes up in hardened utility. 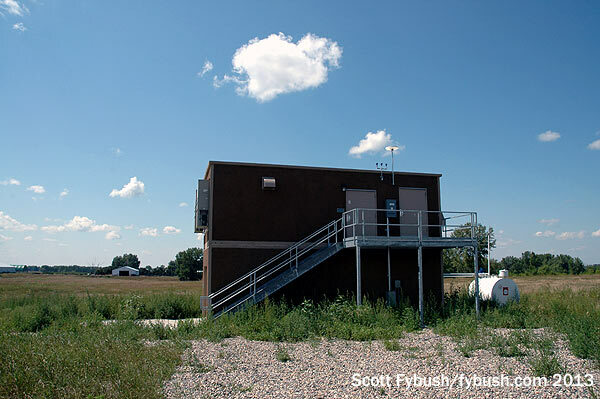 The prefab transmitter building is an unusual two-story configuration, with a garage on the lower level for storage and the transmitter room and generator space elevated high above the floodplain. Even at a distance from the Red River, the flat, flat land here means that when the river floods – and it does – it can get quite wet here. Inside, the compact setup features a Harris DX10 as the rock-solid main transmitter. And all of this is just half the fun we had among the friendly radio and TV folks of Fargo! In part two, coming Dec. 12, we’ll visit public TV and radio, the KVLY/KXJB studios, a whole bunch of AM towers and we’ll even get mentioned on the radio…stay tuned. Thanks to KVLY’s Doug Jenson, KXJB’s Ron Barr and WDAY’s Dave Johnson for the tours! And don’t miss a big batch of Fargo IDs next Wednesday, over at our sister site, TopHour.com!